How Bad is the Recession? So what accounts for this discrepancy? A few years ago, Mark Thoma suggested the answer had something to do with the level of non-defense government consumption expenditures, but a better answer was apparently elusive. This alternative measure of output growth suggests that the recession may have been deeper, and longer-lasting than previously thought, although data for the fourth quarter aren’t yet available. While many economists believe the recession ended in the second quarter of 2009, this income-based measure of output kept shrinking in the third quarter, too. And while the expenditure-based measure is back to its level from the third quarter of 2006, the income-based measure suggests that output is still 3.5 percent below that level. That’s a pretty big hole to dig out of. One way or another, our current recession really does appear to be deeper and longer-lasting than the usual GDP calculations suggest. 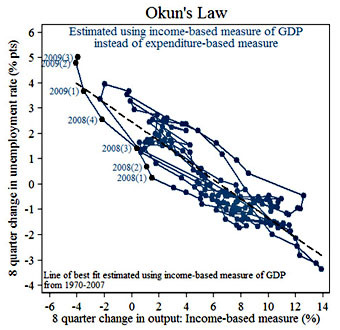 Maybe that’s an illusion, or maybe there really is a problem with the way we measure GDP. We aren’t likely to get any firm answers on this front anytime soon, but at least the questions are worth asking.